Adventures of a Kitchen Penguin: Happy New Year! As we see the tail of tiger retreating and the twitching nose of the rabbit waiting in the wings we know that 2011 is upon us. We're preparing food to take to a New Year's eve party but a year ago I was in Hawaii with my family preparing our traditional New Year foods: soba, ozoni, pig's feet soup, konbu maki, nishime, yokan (homemade this year), namasu and sekihan. 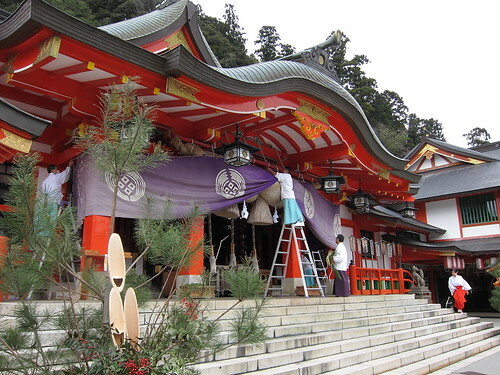 Alas, I'm on the east coast and the nearest shinto shrine is over 200 miles away. So I participate in my new traditions: spending time with my friends, black eyed peas and Scotch whiskey (not necessarily a New Year's thing but it seems to happen when we get together). I hope that you and yours have a safe and happy New Year. Proceed with diplomacy. Be calm and gentle, but persistent. Photo by Otodana "Decorating for new year."